Our wedding photography studio had the honor of photographing the traditional Punjabi Hindu wedding ceremony and the traditional American wedding reception of a lovely couple, Nitasha Alzate and Carlos Andres Alzate. A wedding in a Northern Indian community is very festive and colorful affair, full of subceremonies and symbolism, all richly significant for the process of establishing a new, prosperous, and harmonic family as the foundation for a new life. We felt other wedding photographers, as well as Indian brides and grooms living in the United States and Canada, would appreciate detailed information about a traditional Punjabi Indian wedding, illustrated with authentic photographs. That's why we put together this page. Nitasha and Andres were engaged eight months before the wedding. They exchanged their engagement rings during a private, religious function in front of a pandit—a religious head—and their friends and relatives. 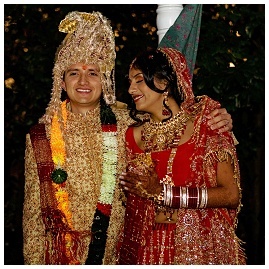 After the engagement, Nitasha and her mother arranged a special trip to India to purchase wedding clothes and jewelry for the bride and groom and family members. Sarah Slavik Photography didn't photograph the engagement, however. We met with the couple for the first time four days before their wedding in the studio for a consultation and combined bridal and engagement portrait session. Our photographic coverage started at the groom's home on the morning of the day before the wedding. The bride's family visited the groom and his parents, bringing the suhag ki pitari: a decorated basket full of gifts. Among them were a golden ring for the groom, clothes, fruit, and monetary gifts. The bride's father tied a colorful thread around the groom's wrist. Then every member of the bride's family who was there (her parents, grandparents, uncle, aunt, and sister) stuck a rice seed on the groom's forehead and fed him rice cookies and blessed him with money to wish him wealth. That afternoon, a cleansing ceremony was held at the bride's home. Its namesake, uptan, is a paste made of turmeric, sandalwood powder, and rose water. The bride's mother and aunt (the married female members of the family) massaged it onto her face and neck, to cleanse and cool her body and soul. Then the bride was fed boiled rice. From then until the wedding, both she and the groom were forbidden to expose themselves to the physical -- or emotional -- elements. In the Chuda Chadana ceremony, Nitasha received a set of choodas: red and white ivory bangles. Tradition says an Indian bride should wear these for at least a year. The reason? For good luck in her new home. Most modern Indian brides actually only wear the choodas for about five weeks. The bride's grandfather, grandmother, mother, sister, and brother all helped her don the choodas. Then they all blessed the bride and fed her rice cakes. In the early evening, the groom's family arrived at the bride's home with the suhag ki pitari. These -- gifts for the bride -- included golden jewelry, clothes, veils, and money. The groom's mother, father, brothers, and sisters in law all blessed the bride. Sangeet is one of the most fun rituals surrounding an Indian wedding. We could witness a gathering of both families and friends, with food and drink and traditional Indian music including Indian songs sung to the beat of a wooden drum. 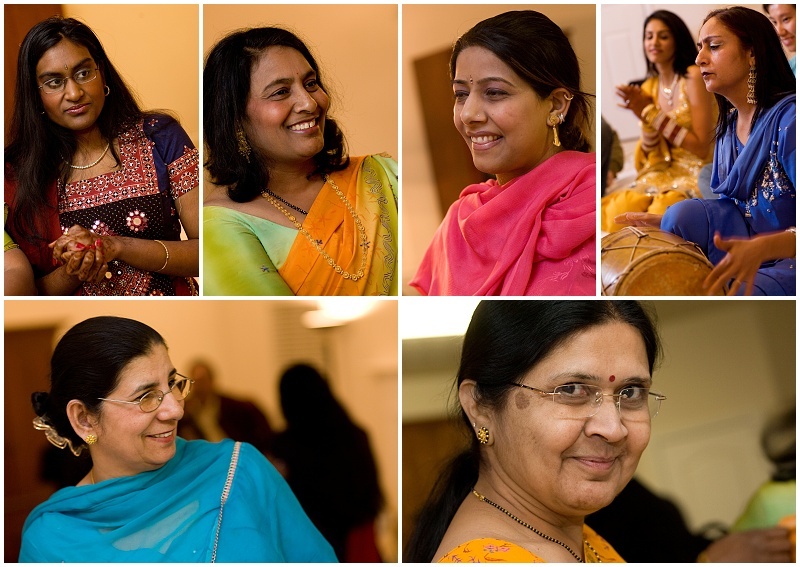 Usually a sangeet is celebrated by a bride's female family and friends. Like the sangeet, the mehndi celebration took place the night before the wedding. Mehndi (also mehendi) is so named because during it, mehndi henna tattoo paste is applied on the hands and feet of the bride and the hands of the other females. The best designs, of course, are bestowed upon the bride. Among the intricate details and beautiful patterns she receives are peacocks and paisleys as symbols of passion. Tradition says that the longer mehndi is kept, the stronger the marriage. And that the darker the henna stains are, the more the mother-in-law will like her son's wife, and the happier the marriage will be. Because Nitasha's mehndi came just one day prior to the wedding -- a time when she was also taking part in various other rituals -- she had her henna paints applied on her hands and feet two nights in advance. Wedding day concludes this series of ceremonies whose goal is to unite the bride and groom so firmly that they become one soul. 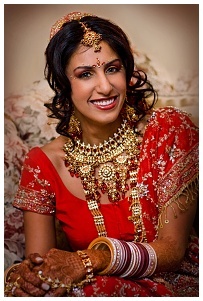 The Indian bridal dress is usually in traditional colors like red, orange, or magenta. Nitasha wore red lehenga with heavy and delicate embroidery and stone work. She was adorned with traditional gold jewelry; the whole set weighed more than 30 pounds. The groom was dressed in traditional Hindu attire. Just before the groom left his home, the married ladies of his family tied the pagadi (turban) and the sehra (floral veil), which covered the groom's face to protect him from the evil eye. Traditionally, the groom rides to the wedding location on a ghodi, a mare. The ghodi is decorated before his trip during ghodi sajana, the decorating of the mare. Andres, however, arrived at the ceremony site in a car. The groom arrives, accompanied by his family and friends. Music is playing, and people are singing and dancing. It's loud. This is the baraat. Then in front of the wedding venue, the bride's family and close friends greet them with flower garlands. This is the milani (also milni). Andres was then escorted to the entrance of the venue, where the bablinder, the bride's mother, welcomed him in and blessed him. Before the serious welcome came a playful ritual barrier: the bride's siblings and friends asked a bribe in order to let him in. After brief negotiations, the door was cleared, and the groom could come inside. Before proceeding to the mandap (the wedding canopy), the couple exchanged garlands -- jaimala (also jayamala). It signifies the union of two bodies and two souls into one entity. Jaimala brings yet more ritual play. Friends lift up the groom to make it harder for her to give him her garland. But her friends then balance the scales: they lift her up, too. Jaimala is a great occasion to relax the bride and groom before their wedding ceremony. After jaimala, the groom was escorted to the mandap while the bride waited in the house. Everybody in the mandap sits on a canvas sheet with their shoes off, which gave an opportunity for the bride's side to play a small ritual prank, that of stealing and hiding the groom's shoes. The groom's side had to chase them, bargain for several minutes, and pay to get his shoes back. The ceremony took place in the mandap wedding canopy, also known as the marriage altar. 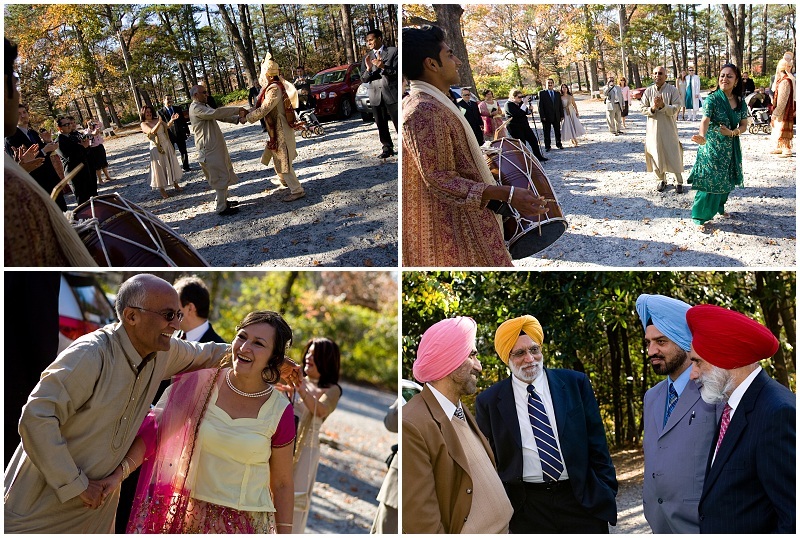 The Hindu Panjabi wedding ceremony is usually much longer than average American one; it can last for about two hours. It consists of series of prayers, functions, and celebrations with specific meanings in a specific order. All the ceremonies you'll see and read about below were conducted in ancient Sanskrit. The ceremony opened with the worship of Lord Ganesha, the elephant-headed god, in the presence of just the groom and the bride's father and mother. 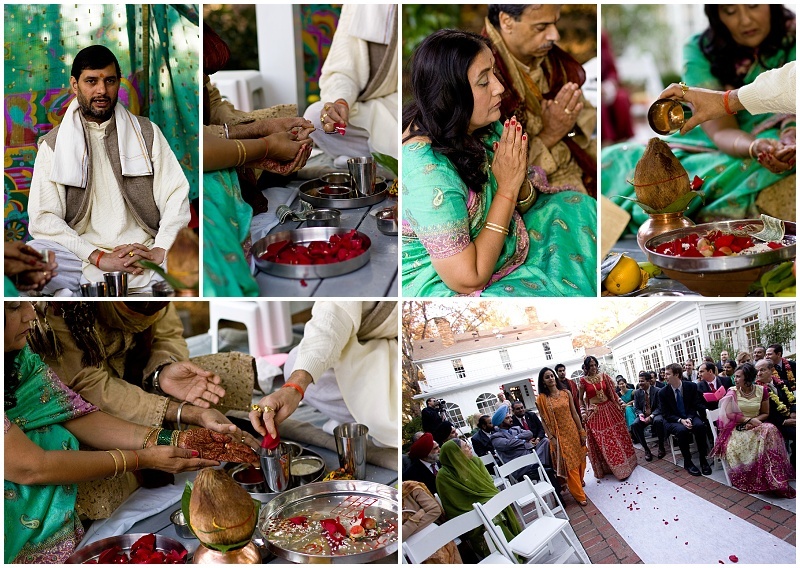 During the priest's mantras, Nitasha's parents welcomed and honored the groom. The flowers signify beauty and joy; the rice grains represent the food necessary to maintain life. The bride is then escorted to the mandap and seated oposite to the groom. The father cups a small bowl holding money in his hand; the mother cups her hand beneath. Above the bowl, the father places the bride's finger into the groom's hand. The bride's parents, in prayer, give the hands of their dearly beloved daughter to the groom. He accepts them, with love and affection. The priest then holds his hand over all these hands and pour water on them, purifying their union, and blesses them with happiness and prosperity. This is considered one of the most important rituals of the ceremony. After kanya daan, Nitasha could sit down to the right of the groom. 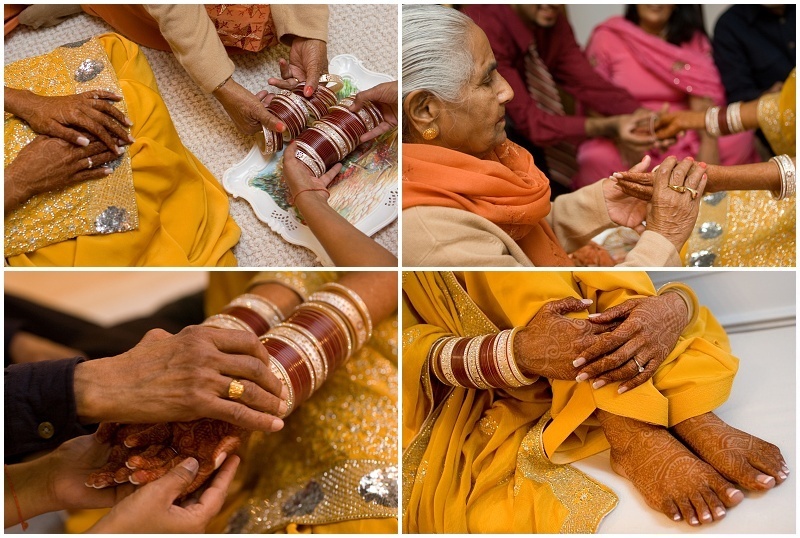 In Hindu Punjabi weddings, "tying the knot" is no mere phrase. To symbolize the newlyweds' inseparability and grant them good luck, Nitasha's sister tied the corners of the couple's garments together: gaanth bandhan. Both of Nitasha's parents applied tilaks to her forehead, and Andres' as well. They then filled the couple's hands with betel nuts and rice, signifying their unity, prosperity, and happiness. Agni, the holy fire, is lit using butter, wood, incense, and camphor. It symbolizes the illumination of knowledge and happiness, witnesses the couple's holy union, and brings warmth upon their life. When the fire is lit up, the priest chants mantras to ensure the couple's marriage will be a long one. The bride places her right foot on a rock while the groom encourages her to be as firm as that rock, and as strong, during any hardships they might share. The couple stands up and walks very slowly around a fire, in seven small circles, led by the priest's mantras. The bride's brother offers the bride a fistful of puffed rice for each circle. She then throws it into the fire, symbolizing fertility and prosperity. In the first four cicles, the bride walks in front of the groom, which means she will lead in all household activities, along the path of dharma, arth, kaama, and moksha. The groom walks ahead in the last three circles, signifying that he will lead in community activities. 1. The first step is about the household, nourishment, and food. 2. The second step is about physical, spiritual, and mental strength. 3. The third step is about preserving wealth and diligence. 4. The fourth step is about togetherness with the parents and happiness. 5. The fifth step is about children and the family. 6. The sixth step is about living together forever. 7. The seventh step is about mutual friendship. After the seven steps, the groom sits to the bride's left, to express that he will keep her in his heart forever. The groom decorates the bride as his wife, with sindhoor, red powder, on her forehead, and promises to cherish and protect her. 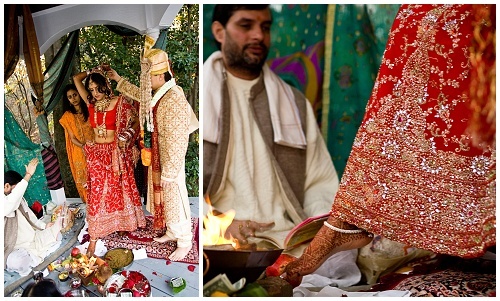 He also gives her the mangal sutra, a golden necklace symbolizing the couple's unity and love. Then Nitasha receives blessings and sindhoor from other family members, and the priest asks for blessings from the supreme Lord. Close family then sprinkles rice and flowers on the couple. The Bride and Groom, Nitasha and Andres, are pronounced husband and wife. Lajahom is one of the most emotional Punjabi Hindu wedding rituals. When leaving the ceremony venue, the sister offers the bride puffed rice: laja, or phulian. Using both hands, she throws it over her head at her family members. She keeps throwing it as she walks, until she reaches the decorated car, the palanquin, that takes her away from her parents. By throwing rice, she is symbolically paying back her parents for all the care she has received from them until this day. The bride and groom, their parents, and some family members changed clothes and met all guests at a lavish dinner and joyful reception to celebrate the new marriage. Feel welcome to enjoy the reception slideshow. The pictures look amazing! I had smile on my face all day long. Thank you so much! Andres and I both LOVED how the images came out to be. I almost cried y'day...again. All I can say is that you both are the best people we have ever had a chance to work or interact with. We are very very very very glad that we chose you as our photographer, because you certainly went above and beyond in everything. Your commitment is admirable!